If you are installing a new shower, the sealant is an essential part of the process. Without it, you lose that watertight seal that keeps the water away from under your tiles and protects your walls and floor. Even if you already have sealant in place, it’s not something that will last forever, and there will come a time when it needs to be replaced. Sometimes, it will get covered in black mould from prolonged exposure to moisture and cannot be cleaned. Other times, it will lose its adhesion and peel away from the surface. You might be sat here thinking that you have no idea how to fix this issue, and are currently sighing over the costs you can expect from a handyman. However, it’s not a difficult task at all, and this guide will transform you into a sealant expert. Why not give it a try? How Long Should Shower Sealant Last? How Long Do You Need to Leave Silicone Sealant to Dry? How Often Should You Reseal a Shower? A lot of this can be down to how often it is used, the quality of the sealant, and how well it is maintained. A poor-quality sealant won’t usually last as long, and may need to be resealed once or twice a year. A good sealant could last as long as ten years, although it is often closer to five. If your sealant becomes mouldy and you cannot clean it all off, it will need to be replaced quickly to avoid health issues, and you may need to consider a dehumidifier or ventilation system. While it is really down to individual situations, we can roughly estimate that the sealant will last around three years – based on the average between poor and good quality sealants. Now, this really does depend on a few factors; the sealant type and the temperature of the bathroom. There are some sealants that will be dry in an hour, and while this might seem like a very tempting choice, they do also tend to be poorer quality than others on the market, and so you will find they need to be replaced more frequently and they may also fall apart faster. Higher quality silicone sealant will take longer to dry, and this is where the temperature factor comes into play. If it is cold in your bathroom, it will take 36 hours to dry, and in a warm room, it will be 24 hours. However, if it is too warm, then you may end up with a film over the sealant, or it may not stick correctly to the surface. This is why a temperature of 18C is recommended. Similar to the first section in this guide, it really does depend on your personal circumstances, as well as issues like mould, and the frequency you use the shower. Often, the sealant on a bath will need to be replaced a lot less because it is not used as often as a shower. If you use a sealant that is poor in terms of quality, it is often advised that you replace it every 6-12 months to ensure that it remains adhesive and watertight. If your shower is used regularly, you can usually get away with resealing it every two years without an issue, as it will generally remain waterproof (especially if you are using a good quality sealant). Mould can be an issue as well, causing you to need to reseal more regularly, but there is a way around this. The second you spot the mould, make sure to clean and remove it instead of leaving it for later; because this is how it ends up being too late. You should also consider improving ventilation. Once you have gathered all of these tools and items, you will be ready to move onto the next stage and get the work done. Check out the next section for detailed steps on how to seal your shower. Below are each of the steps you need to follow in order to seal your shower quickly and professionally. Of course, there are a couple of things you should remember before we go any further. The first is that you should always read the instructions on the sealant that you buy, as the manufacturer may have a couple of specific steps that need to be taken. The area should be completely clean, so free from dust and dirt, to ensure that it sticks to the area properly. If the area is damp, it may also reduce the adhesion, so you should make sure that it is entirely dry in order to get the best possible results. Check that the area is clean and dry, but also that you have silicone sealant and not grout or caulk. This is because silicone sealant is the only waterproof product out of the three, and it is also a lot more flexible, which means it can be used on joints and edges without cracking. Place the tube into the sealant gun, and you will be ready to go. Take your masking tape and stick it along the shower tray with a 3mm gap between it and the wall. Then, grab another length of tape and place it 3mm above the bathtub. This will leave you with a good gap for the silicone sealant to be placed. It also means that if you spill any, it will get on the tap instead of your surfaces, making it easier to clean. Cut the nozzle according to the instructions on it, and ensure that you are using the narrowest point on it. Then, run it along the edge of the tray slowly, making sure that every gap is filled. You can use a sealant tool or your finger to push anything that is falling out back into the gaps. Before you move onto the next area, ensure that it is completely airtight and that there are no gaps. Now take the Stanley knife and cut further down the nozzle. This will give you a wider opening, and therefore a wider layer of silicone sealant. Use it to go over the areas that you have already applied the sealant to, creating a second layer around the entirety of the shower tray. You can use your finger to check that there are no gaps or lumps in the silicone sealant by running it along the strips after dampening it a little. Once you have confirmed this, remove the masking tape quickly before the sealant dries. Wipe the excess away from the sealant nozzle and replace the cap, remembering to release the pressure so that it does not leak into the lid. Use the damp cloth to wipe away any sealant that has managed to make its way into your shower tray so that you can have it all clean before it dries. Use the smoothing tool to make sure that everything is nice and neat, and generally give it a good tidy up so that when it dries, it looks professional. Clear up any excess from this and then leave the silicone sealant to fully dry before you use your shower again. 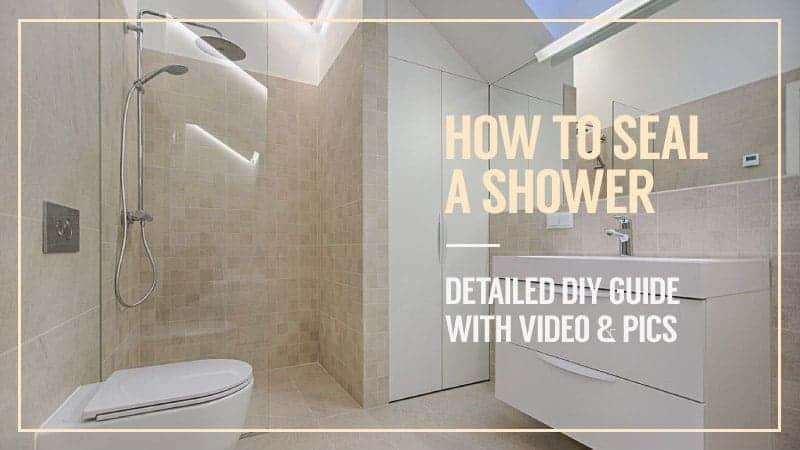 Hopefully, this guide has been able to teach you all about how to seal your shower, but also give you some useful information about silicone sealant and its maintenance. It’s actually quite easy to do, but we will give you the same advice we always do with home renovation projects – take your time and do it slowly to avoid mistakes. There’s no rush, and your bathroom will be left looking amazing. What did you think of our shower sealing guide? Did it help you to become an expert in the field, or are there things that you would have liked to see included. We love hearing from you, so why not send us a message, or even a picture of the finished job, in the comment section below.